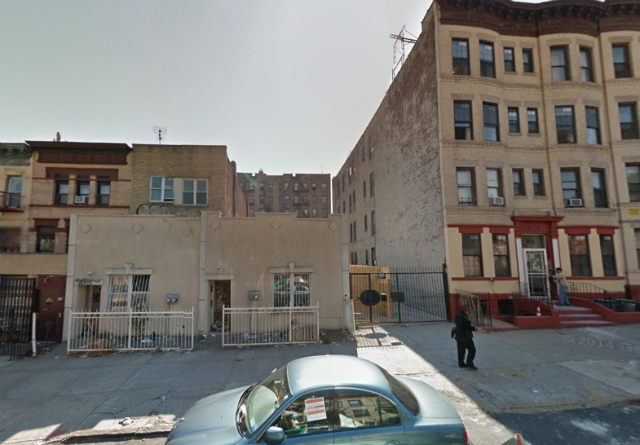 Yesterday, a permit application was filed for a new apartment building at 806 St. John’s Place, in the Crown Heights section of central Brooklyn. The five-story, 50-foot-tall building is planned for an irregularly shaped parcel with 30 feet of frontage on St. John’s, between Rogers and Nostrand Avenues, in the trendy part of Crown Heights north of Eastern Parkway. The project is planned to consist of 26 apartments spread over nearly 18,000 square feet of residential space, for an average unit size of less than 700 square feet – surely rentals. The building will have four apartments on the ground floor and four on the fifth floor, with six units per floor in between. The unrelenting zoning code will force the developer to wedge 13 surface parking spaces into the project, nevermind the fact that the vast majority of Crown Heights’ building stock was built before World War II and has no off-street parking whatsoever. The builder is also managing to fit 644 square feet of open “recreation space” into the project, according to the Schedule A filing. The land is currently home to two buildings – a single-family home and a two-family structure – that will need to be demolished. The lots last traded hands last year, when they sold for $980,000, or around $55 per buildable square foot, according to city records (which seems a bit low to us). According to the new building permit, Zalmen Kaufman, based in the Hasidic section of northwestern Bed-Stuy, is the developer. KMP Design and Engineering, led by Kenneth Philogene and based nearby on Rogers Avenue in Prospect Lefferts Gardens, is listed as the architect.